Barbara Mertz might not be a name that you immediately recognize, but you just might recognize her pen names. She was the best-selling mystery writer who wrote dozens of novels under the pen names of Elizabeth Peters and Barbara Michaels. Sadly, she passed away in her home on the morning of August 8, 2013. Mertz is survived by her children, Elizabeth and Peter, and six grandchildren. Barbara Mertz earned a PhD from the University of Chicago in Egyptology at the age of 23. 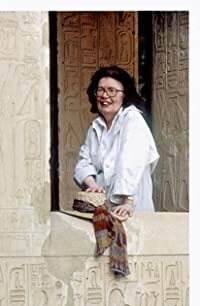 She first became a published writer in 1964 and authored two books on ancient Egypt, (Temples, Tombs, and Hieroglyphs (1964 with a revised edition in 2007) and Red Land, Black Land (1978 with a revised edition in 2008) Both books have been continuously in print since their first publication. Mertz used the pseudonym Elizabeth Peters to pen more than 3 dozen mysteries. Several are stand-alone novels, including Summer of the Dragon (1979), and The Copenhagen Connection (1982), but she is perhaps best know for her series mysteries. One series dear to my heart is about Jacqueline Kirby; who just happens to be a librarian with a very large purse and a knack for solving mysteries. Jacqueline makes her first appearance as an unwilling detective in The Seventh Sinner (1972). Another Elizabeth Peters series is the Vicky Bliss Mysteries, which follows the adventures of an American art history professor who keeps getting involved in international crime and her love interest, a charming art thief known as Sir John Smythe. The first book in this series is Borrower of the Night (1973). As Elizabeth Peters, Mertz may be best known for the 19 book Amelia Peabody series, the last of which was published in April of 2010. The heroine is an Egyptologist and the stories all relate to the “Golden Age” of Egyptology, spanning the 1880s to 1922. The first book in the series is Crocodile on the Sandbank, first published in 1976. There is also a companion book, Amelia Peabody’s Egypt: A Compendium, published in 2003. As Barbara Michaels, Mertz wrote primarily Gothic and supernatural thrillers, including twenty four stand-alone novels including Be Buried in the Rain (1985), Search the Shadows (1987), Smoke and Mirrors (1989), Into the Darkness (1990), Vanish with the Rose (1992), Houses of Stone (1993), The Dancing Floor (1997), and Other Worlds (1999). You can find more information about Barbara Mertz and her books on her website http://www.mpmbooks.com/, which sadly does not seem to have been updated since last fall, but still has the most comprehensive information about her body of work.